Every holiday season, fishermen are renting their boats to visitors. 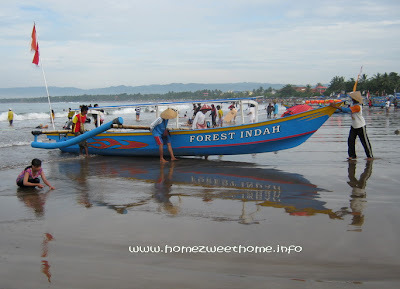 These boats will take visitors to reach Pantai Pasir Putih (White Sand Beach) from Pantai Barat Pangandaran (West Pangandaran Beach), West Java, Indonesia. It’s a great way for increasing their income. What a wise idea for making a bit more money. 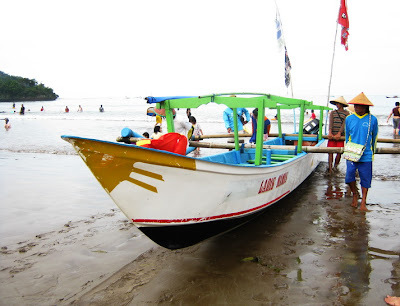 The fishing boats themselves have so much personality and are so pretty in their vibrant colors. Nice photography. Great post.. U kNow,, I ever reNt The Boat For TraVelliNg arOund ThaT beaCh,, Then i sToppEd aT tHe Middle of The sea To see The BeaUtiFul cOral ThoroUghLy..
you're country is famous for beautiful islands and sandy white beaches. A pretty good idea to make money. Great shot Lina! Beautiful shore of Indonesia! Selamat Malam! I wish I could visit your country someday. Interesting view of a part of the world so very far away.